In our discussion we are going to discuss a piece of software that is available for the iPad. The name of the software is WritePad and it has been developed by PhatWare. It has recently been upgraded to version 6.0 and has a new multilingual handwriting recognition engine. This new engine supports English, German, French, Dutch, Spanish, Italian and Portuguese. The software allows the user to take notes in their own handwriting. They can use the iPad stylus pen or they can even write with their own finger. This software will adapt to and learn the user’s style of writing. The software also recognizes simple gestures to do such things as select text, cut, and copy or paste text and also insert special characters. Here are some of the other features that you will find in this software. 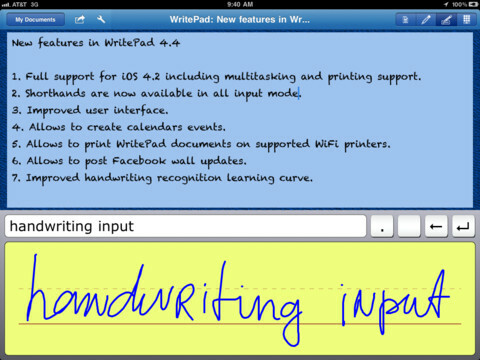 You can email, tweet, print, or post Facebook updates directly from WritePad. You can synchronize WritePad documents with Dropbox, Evernote and iTunes. You can also upload documents to Google Docs. You can use the Bing Translator and translate documents to the supported languages. You can change the way WritePad looks by manipulating the text, the page, and the ink colors using the customizable Styles feature. This software will improve your productivity as it can use inline gestures, a spell checker, a content analyzer and shorthand features. The statistical analyzer that is built into the software will help you improve your overall handwriting recognition quality by addressing common recognition errors. 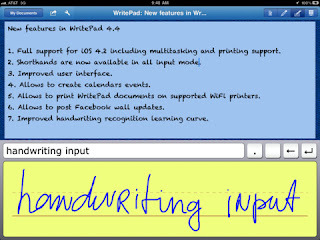 As we already mentioned, the WritePad can also learn the handwriting style of the user. This software will definitely help you as you create and edit your text documents and use the handwriting recognition engine or the iPad keyboard for entry of your text in landscape or portrait mode. Give this software a try and see how it can improve your writing. 0 Respones to "The WritePad Application"